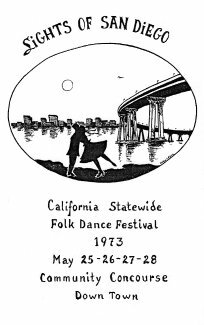 Two new Federation Presidents, Dolly Barnes of the North and Albert Dobrinsky (call me "Al") of the South, led their respective folk dancers to San Diego for the 28th Annual Statewide Festival, May 25, 26, 27, and 28, 1973. My book, containing all Statewide programs, will be embellished, starting with the 1973 copy by the addition of photo shots taken at the Past President's Party, providing I remember to bring my camera. Headquarters hotel is again the U.S. Grant, where the Friday night After Party was held as well as the Saturday night Installation Dinner. For the Friday opening party, the dancing was at the Balboa Park Club, a little early for some. 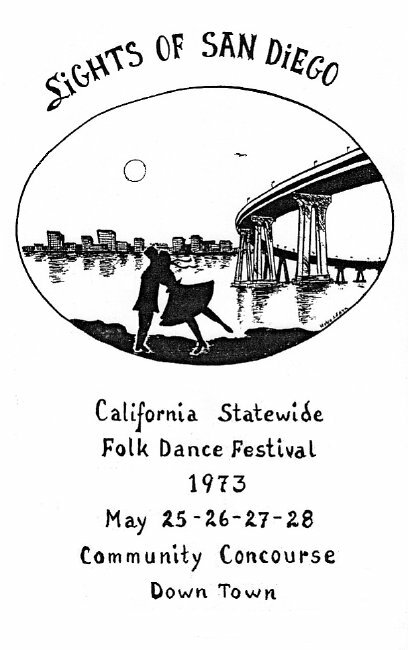 All dancing from Saturday through Monday will take place at San Diego's fine Community Concourse. This includes the Institute Saturday afternoon. The Kolo dancers, in addition to the After Parties, have been alloted an hour prior to each regular dance program, to do line dances and to live music. The general folk dancing for Saturday night, Sunday afternoon and night, along with the Get Away Party Monday afternoon, will all be in the Concourse Golden Hall. The Concert Sunday night will take place in the Civic Theatre and as usual will be a great show. Al Dobrinsky and Dolly Barnes will install the new officers during the Installation Dinner in the U.S. Grant. There will be no pinning of Past Presidents this year as both Al and Dolly are installing themselves for a second term as president. I can think of no nicer spot to spend a few days than San Diego with its beautiful drives, its island night clubs, and its scenic beauty. There is always time between dancing to take advantage of the city's show places, such as their great Zoo, which is a must. Thank you San Diego and thanks to the following committee members who worked so hard to show us a great time: General Chairperson, Vivian Woll; Concert, John Hancock and Elizabeth Ullrich; Decorations, Steve Henderson; Installation Dinnner, Milly Calkins; Institute, Carol Walker; Masters of Ceremonies and Callers, Valerie Staigh; Pre-Registration, Elsa Miller; Program, Laura Lippett; Publicity, Pearl Bleadon and Greg Smith; Sound, Wayne Ellsworth; and so many more. The cover was designed by Heke Lenym.